Jokes, anecdotes and stories as told by native English speakers. 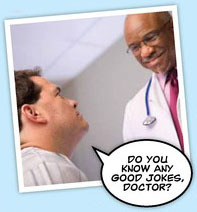 Patient: Doctor! Doctor! I think I’m invisible. Good news! The latest issue of Hot English (188 – the January issue) is out now! Learn over 300 useful words and expressions and improve your listening skills with Learn Hot English! 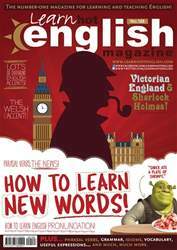 Get your copy here: https://pocketmags.com/quickbuy/learn-hot-english This month: how to learn new words. Read our top tips to help you learn new and difficult words and really improve your range of vocabulary. Plus, 12 useful words and expressions for talking about getting to work, 10 useful words for talking about fruit, useful words for talking about websites, 8 expressions for describing people who are strange or unusual, “news” phrasal verbs... plus: • Science – the Ig Nobels. • Fashion – wacky clothes. • Drinks – cocktail fun. • Environment – plastic. • Film – Sherlock Holmes. • History – Victorian England. • Literature – Sir Arthur Conan Doyle. • Grammar – So & such • Hollywood – Guy Ritchie & Jude Law. • Food – onion soup. • London accents – Cockney English. • Slang – English slang. • British accents – Welsh. • Trends – British food. • Language – palindromes. AND LOTS, LOTS MORE! By reading and listening to all this great content, you'll improve your English reading and listening skills and learn up to 300 useful words or expressions. Plus, you'll get a better job and pass English-language exams more easily. Guaranteed! 10 fun facts about cocktails! 6 TOP TIPS FOR LEARNING DIFFICULT WORDS!